Here is another pre-loved item my friend Chris would like to put up for sale. It’s a locally made play cot/play pan, and it looks like this. He’s willing to let this go for RM80. If you are interested and need further information, do contact him at chrisengku@gmail.com. A friend of mine, Chris, has a preloved Combi Double Stroller For Sale. The model looks like the below photo, and it’s in very good condition. Like all Combi stoller, it is light weight, and has quick fold feature (i.e. quickly folded with a single hand). Chris is willing to let this go for RM600. If you are interested or need further information about the stroller, please contact him at chrisengku@gmail.com. The girls have outgrown their strollers. Here is one we bought especially for air travel because it’s lightweight. It has a strap that you can strap around your shoulder and run while you have to do a dash from A to B, or when the road is too stroller unfriendly, or even when the child refuse to be on the stroller but you’d already brought it out. We paid ~RM400 for it, and now selling for RM150. Self collection preferred. When folded, it takes up very little space. I’m very sure I’ll not have No.3, so I’m trying to sell of some of the things the girls used to use. 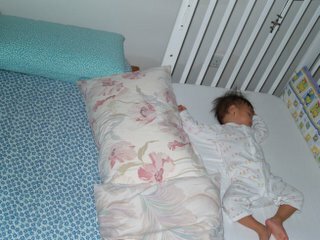 This one is Zara’s cot. It’s white Safe N Sound Cot which can be used up to 6 yrs old. We bought this end 2004, it was used by Zara for 1.5yrs, and then stored up. Later, since Zaria is sleeping with us 100% since birth, it was used mainly to change her after her bath and to ‘confine’ her when Jelly needed to clean up the room (for 1yr). The cot fits a mattress size of 70x132cm. Condition of the cot : There are only some finger print smudges on the railing (where her name is stuck on) b’cos Zaria drew on her hands, and then held on to the railing trying to peel of the alphabets forming her name). Condition of the mattress : Some light stain. I’m selling off my Medela Pump-In-Style Traveller Breast Pump for RM500 (including 4 other breastfeeding gears). I bought this when Zara was about 8months, around September 2005. I used it not as frequent as I should especially after I’d started working from home.